Thanks to the great Shannon, we now know Anaheim Disneyland has the Protocol Droids! 2 for $21.95. cheap. I've got a bunch of these (thank you Shannon!) and reviews will be going into Figure of the Day semi-irregularly, as often as I can. If you're in Southern California, perhaps a trip to the house of mouse is due soon. 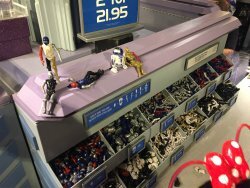 There are multiple styles and colors, but not every droid is available in every color. As far as we know there are no new styles available from Orlando, but if you discover otherwise please let us know!